Kee Facts: How A Thousand Points Of Light Lit The National Tree Billions of brilliant lights sparkle on houses and trees around the nation as people celebrate the Christmas season. Those lights have also given American presidents reason to joyfully flip the switch on the national tree for nearly 90 years. The 2011 national Christmas tree is a 26-foot Colorado blue spruce. It was planted just this year after a windstorm blew down the last tree. Americans use about 30 billion light bulbs in holiday decorating each year — blinking, flickering, sparkling arrays of color that illuminate our houses, city streets and office cubicles. The tradition started out on a much smaller scale, but it wasn't long after Thomas Edison invented the light bulb that someone first thought of putting them on a Christmas tree. Edward Hibberd Johnson, an associate of Edison, was the first to drape a string of electric lights on his family's holiday tree in 1882. A reporter for the Detroit Post and Tribune visited Johnson's home to find "a large Christmas tree presenting a most picturesque and uncanny aspect." "It was brilliantly lighted with many colored globes about as large as an English walnut, and was turning some six times a minute ... the scintillating evergreen was a pretty sight." It took a couple more decades before tree lights became available commercially, and when they did, they were very expensive. The lights that first adorned the national Christmas tree were — unsurprisingly — red, white and blue. The tradition of a national tree was born in 1913 on the east plaza of the U.S. Capitol, where a Norway spruce stood underneath a blazing electric sign proclaiming "Peace on earth, good will to men." A huge crowd gathered for the celebration, listening to a performance by the U.S. Marine Band and 1,000 singers surrounding an elaborate Nativity pageant. 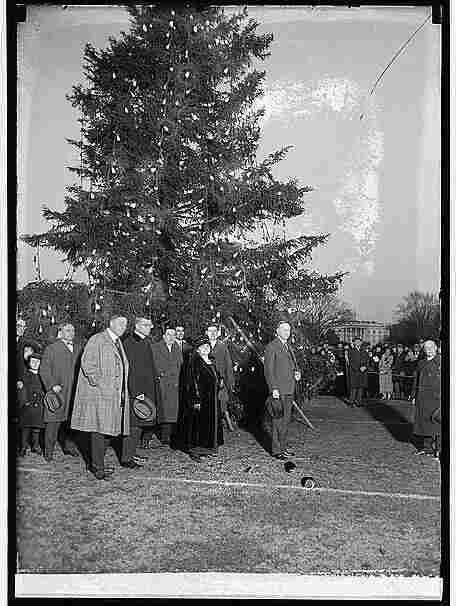 Ten years later, Calvin Coolidge became the first president to touch a button to illuminate thousands of electric lights on the national Christmas tree. By then, the tree was located on the Ellipse near the White House. The grounds of the executive mansion were opened, and the public was invited in to sing carols. 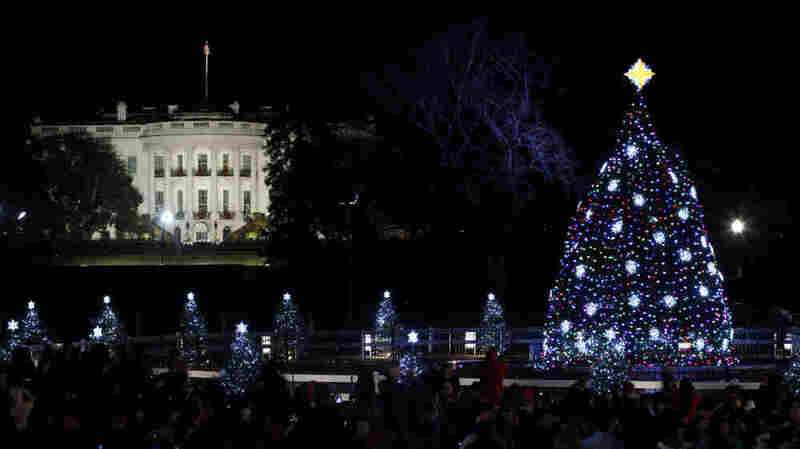 Yet the national tree went dark in 1973; President Nixon didn't light the tree because of the energy crisis. Floodlights lit the tree from its base, but there were no lights on the tree itself. President Carter also left the tree dark in 1979 and 1980, to honor the Americans who were being held hostage in Iran. By 2009, the national Christmas tree was using light-emitting diode technology exclusively, because LED bulbs use less electricity, last longer, and don't break as easily as the old-fashioned kind. The tree for 2011 — a Colorado blue spruce — was planted on the Ellipse in March after the previous tree was blown over in a windstorm. On Dec. 1, President Obama urged the American people to "reaffirm our commitment to each other, as family members, as neighbors, as Americans, regardless of our color or creed or faith. Let us remember that we are one, and we are a family." Then, surrounded by his family, Santa Claus and Kermit the Frog, Obama flipped the switch to light the tree, and everyone sang "Winter Wonderland."